Jamie Teissere, guitarist of defunct metal band DROID, has announced the launch of his new project, SUNFLOWER DEAD. After multiple US tours with bands such as FIVE FINGER DEATH PUNCH and HELLYEAH supporting Droid's debut on Munky from KORN's Emotional Syphon Recordings, the guitarist was by no means ready to quit the music game after Droid's sudden demise. Wasting no time, he assembled a new outfit consisting of Michael (vocals, piano, accordion), Jaboo (guitar) formerly of TWO HIT CREEPER, Luis Gascon (bass) touring member of BUCKETHEAD, and Jimmy Schultz (drums) touring drummer of IN THIS MOMENT with a goal of creating an undeniable unit that would not just move but more importantly, entertain people. 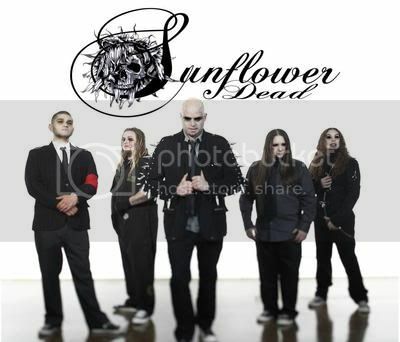 The group dubbed themselves Sunflower Dead and went into Temple Studios (owned by Raymond Herrera of FEAR FACTORY and B Real of CYPRESS HILL) with Christian Olde Wolbers (Fear Factory) to produce their 11- track self-titled debut record, set to release on August 21st via Bloody Bat Records LLC. Co-produced and mixed by Jeremy Blair (GUNS N' ROSES, DEVILDRIVER) at Temple and House of Blues Studios, and mastered by Robert Hadley (Korn) at The Mastering Lab, the album has a tight, punchy sound with crushing low end and ultra wide sonics. This record is an intense, in your face, emotionally charged roller coaster of dark, aggressive, and spell-bindingly dynamic heaviness with no shortage of anthemic sing along vocals. The band recently released an EPK teaser that can be viewed below. The EPK serves as a first look into Sunflower Dead’s sound, look and story that is described as a cross between Reservoir Dogs, 30 Days of Night, The Crow and The Warriors. Sunflower Dead plans to release a new music video for the single ‘Make Me Drown’ in the coming months. Stay tuned for more updates coming soon on the new self-titled album and music video.